Do You Need A Compound Miter Saw As A Home Owner? Do White Collar Work Injuries Qualify For Workers Compensation? If you starting a brand new woodworking shop from scratch, a compound miter saw might not be the ideal tool you need at first. A better choice of saw would be a table saw, because a table saw can also perform all the functions of a miter saw and more. For one thing, the length or width of boards you can rip or cross cut with a miter saw is greatly limited when compared to the length you can rip cut with a table saw, even if you are using a sliding compound miter saw. Rip cuts are better carried out using a table saw. However, if you’re a home owner who needs a saw to carry out some home improvement projects or repairs around your home, then a miter saw will come very handy. For instance, if you’re building a fence around your home, or maybe you’re trying to build something like a ladder or carry out any kind of construction, you can use a compound miter saw to cut the wood into the different pieces you need to complete the construction. All you have to do is hold or clamp the wood against the miter saw fence and pull the blade down slowly. Start the saw first and make sure the blade gets to full speed before bringing it down on the wood. Like every other power tool, a compound miter saw can become a very dangerous tool if not handled properly. So make sure that the hand you’re using to support the wood or work piece is far away from the blade as possible for safety reasons. And also, make sure that you’re not standing or holding the work piece in any awkward position. Apart from cutting wood, a compound miter saw can also be used for cutting electrical conduits and PVC pipes for drainage and plumbing in general. It’s just the same thing, just place the pipe on the saw table, line it up against the fence, switch on the saw and just cut it. A compound miter saw is also used for making miter cuts or angle cuts. That’s why it is called a miter saw in the first place. The table of the miter saw can be rotated left and right into different angles to make angle cuts or miter in both directions, and the table has calibrations to help you set up the miter saw at the angle you want to cut at. 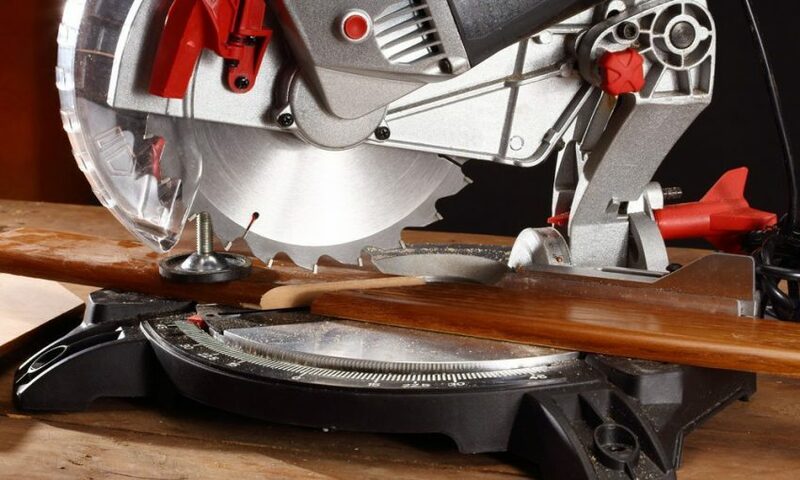 The miter saw is set in such a way that, once you start rotating the table, it will lock in the most commonly used angles like the 45 degree angle. The mitering ability of the miter saw comes very handy when you want to cut things like crown moldings for installation, and even when you want to cut 45 degree angles for your picture frames. These are just some of the things you can do with a compound miter saw if you’re a home owner, to say the least. There are many other uses for a compound miter saw and there are many types as well. So, if you’re a home owner looking to get more done around your home, a portable 10 inch compound miter saw might just be all you need for a saw.